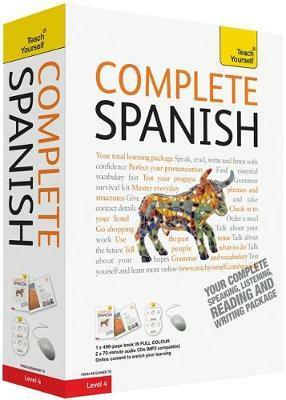 Are you looking for a complete course in Spanish which takes you effortlessly from beginner to confident speaker? 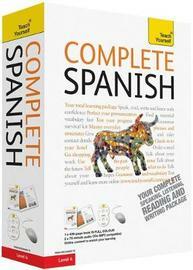 Whether you are starting from scratch, or are just out of practice, Complete Spanish will guarantee success! Now fully updated to make your language learning experience fun and interactive. You can still rely on the benefits of a top language teacher and our years of teaching experience, but now with added learning features within the course and online. The course is structured in 25 thematic units and the emphasis is placed on communication, so that you effortlessly progress from introducing yourself and dealing with everyday situations, to using the phone and talking about work. By the end of this course, you will be at Level B2 of the Common European Framework for Languages: Can interact with a degree of fluency and spontaneity that makes regular interaction with native speakers quite possible without strain for either party. Learn effortlessly with full colour text, easy-to-read page design and interactive features: NOT GOT MUCH TIME? One, five and ten-minute introductions to key principles to get you started. AUTHOR INSIGHTS Lots of instant help with common problems and quick tips for success, based on the author's many years of experience. GRAMMAR TIPS Easy-to-follow building blocks to give you a clear understanding. USEFUL VOCABULARY Easy to find and learn, to build a solid foundation for speaking. DIALOGUES Read and listen to everyday dialogues to help you speak and understand fast. PRONUNCIATION Don't sound like a tourist! Perfect your pronunciation before you go. TEST YOURSELF Tests in the book and online to keep track of your progress. EXTEND YOUR KNOWLEDGE Extra online articles at: www.teachyourself.com to give you a richer understanding of the culture and history of Spain. TRY THIS Innovative exercises illustrate what you've learnt and how to use it. The course is available as a book (9781444100006), as a pack comprising the book and double CD (9781444100013) and as a double CD (9781444100020).